Did your chemistry teacher use an orange or lemon to demonstrate the concept of a battery, back in the day? You might remember how she magically produced electricity by sticking a couple of metal nails into the citrus fruit, as the whole class watched in awe. 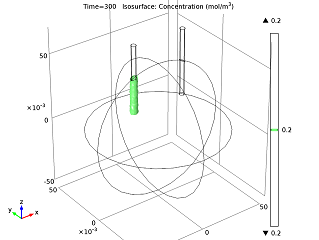 What if we now used simulation tools to demonstrate how an orange battery works, and then use that as an intro to electrochemistry modeling? The geometry of a battery made of an orange. It’s obviously not magic that enables orange batteries to generate electricity — it’s electrochemistry. A citrus fruit, oranges contain citric acid that, together with other ions, serves as an electrolyte. The citric acid electrochemically reacts with the two metal nails, which need to be of different metals to both release and gain electrons. The circuit needs to be completed by allowing the two nails to be electrically connected through a metal conductor, such as a small light bulb (part of the wow-factor in the school laboratory). In this process, our nails serve as electrodes, and there is a galvanic potential over the battery cell (the orange, in this case) that encourages the electron transfer. Since we’re leveraging chemical reactions to turn chemical energy into electrical energy, we can also refer to the orange battery as a voltaic battery, just as any other battery where the energy has been stored in the chemicals it contains. Fun fact: an Italian physicist, Luigi Galvani, discovered “animal electricity” — when he connected two different metals in series in a frog’s leg, it began to twitch, which was actually caused by the movements of ions. Intrigued by this, another Italian physicist, Alessandro Volta, ran his own experiments and concluded that the frog’s leg was simultaneously a conductor and a detector of electricity. Building on this research, he eventually came up with what we call Volta’s Law of the electrochemical series, and later in the 1800s, the first battery. 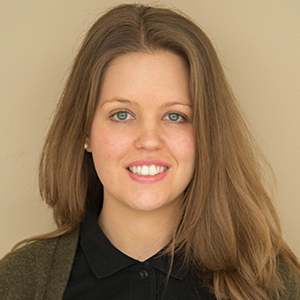 If you are new to modeling electrochemistry applications, you may want to start off with our orange battery model tutorial. 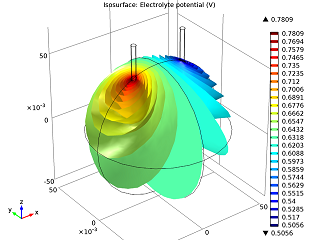 If we follow the step-by-step instructions in the PDF, we can model the currents and dissolved metal ion concentration in the orange battery. 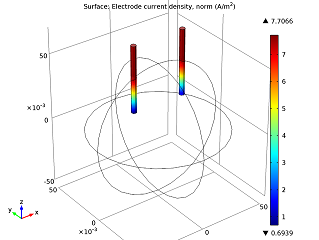 The Secondary Current Distribution interface is used for setting up the model for the currents in the orange and electrodes. Secondary current distribution assumes that electricity moves through the electrolyte only as ionic migration, while the reactions at the electrodes are a function of the electric potential and local concentration of reacting species. Ohm’s law is therefore applied, together with a charge balance, to solve for the electric currents in the nails and the orange’s electrolyte, which are also coupled to Butler-Volmer expressions that describe the electrochemical reactions. 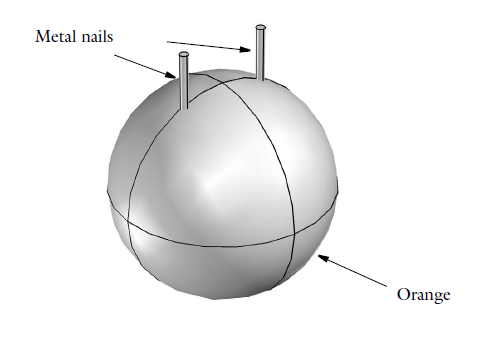 In this example, one of our nails is set to a cell potential of 0.5 V, while the other is grounded, and the current distribution is calculated. Once we have set up and solved the model, we can evaluate the performance of the orange battery. The electrolyte’s potential field. The nails’ electric currents. As we can see in the image above to the left, the electric potential decreases as the current flows from the zinc electrode (left nail) to the copper electrode (right nail). The cell voltage loss is mainly due to Ohmic losses in the electrolyte. If we wanted a better-performing battery, we could swap the orange for fruit with higher conductivity (i.e., more acid content), like a lemon. Alternatively, we could put the nails closer together. In the model above to the right, we can see that the electric current increases along the z-axis. This happens as the tips of the electrodes have access to a greater volume of the orange, and therefore more reacting species, so that they are be able to gain and lose their electrons easier. We can also study the ion concentration level after having run the battery for a while, and can visualize how the cell current changes over time. As the zinc ions build up, they impede the reacting ability of the anode, so the battery current decreases until it reaches a constant current density. Isosurface for a 0.2 mol/m3 concentration level of zinc ions after running the battery for 5 minutes. 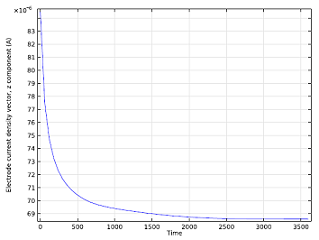 Cell current vs. time. What exactly is that 0.5V cell potential? Why doesn’t the simulation work if I set that cell potential to a value less than 0.2V or a value greater than 1.3V?